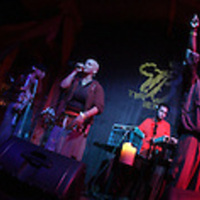 Solillaquists of Sound performing live at at Slingapour's, a venue located at 18 Wall Street in Wall Street Plaza in Downtown Orlando, Florida, on February 19, 2003. The first photograph features, from left to right, Tonya Combs, Alexandrah, DiViNCi and MC Swamburger. The second photograph the first three, minus Swamburger. The third and fourth photographs feature Swamburger with Alexandrah and then with DiViNCi, respectively. The final photograph shows DiViNCi playing a Media Player Classic (MPC). 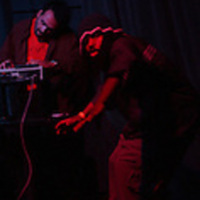 Solillaquists of Sound, also known as Solilla, is an American hip-hop quartet formed in Orlando in August 2002. 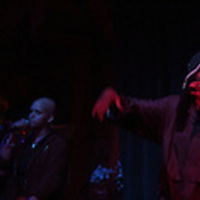 The group, consisting of MCs (masters of ceremonies) Swamburger and Alexandrah, poet/vocalist Tonya Combs, and producer/composer/MPC player DiViNCi, employs sophisticated, socially conscious lyrics and musical composition, based on the life-affirming, justice-oriented views held by the members. The group utilizes melody and harmony in their vocals, often delivering many punctuated syllables in rapid succession in tight synchronicity. In 2002, Asaan Brooks, also known as Swamburger, began having weekly meetings in his Orlando home about music, community involvement, spirituality, and veganism. At one of these meetings, Brooks and his friend, producer and MPC player Glen Valencia, Jr., also known as DiViNCi, with whom he had already recorded material, decided to begin performing together. A frequent attendee of their shows, Tonya Combs, joined them on background vocals, and soon the group's friend, singer Alexandra Sarton, also known as Alexandrah, left her home in Chicago, Illinois, to join the band. The group categorized themselves in their own genre, FAHEEM (funk/astro/hip-hop/extraterrestrially energized message), which they felt more accurately conveyed both their music and their beliefs regarding spirituality, life, and love. They were invited by hip-hop artist Sage Francis to tour with him, and his label, Epitaph, signed them to their sister label, Anti-, in early 2006. They recorded two albums under the label, As If We Existed (2006) and No More Heroes (2008), before leaving the label and producing their own albums, The 4th Wall: Part 1 (2012) and The 4th Wall: Part 2 (2013). 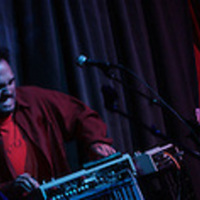 In addition to Francis, the band has toured with artists such as Michael Franti & Spearhead, KRS-One, Bad Brains, Ozomatli, El-P, and Lyrics Born. The group is also known for their community involvement, appearing on a tribute record for fellow rapper/producer J Dilla, also known as James Dewitt Yancey, who passed away in 2006 from a blood disease. The album, Death of the Muse, featured J-Live, Chali 2na of Jurassic 5, and Maureen "Ma Dukes" Yancey,Maureen Yancey, the mother of J Dilla. Okayplayer.com featured the effort as one of their top news stories, and LA Weekly called the track "the most awesome song in the history of awesomedom." The group hopes to open the Solilla Center 4 Creative Kids, a non-profit school designed to empower youth with the knowledge of all things good for mind, body, and spirit, offering kids yoga, an art gallery, massage, a cafe, smoothie and juice bar, language, art, poetry, gardening, and vegan cooking classes, as well as an after-school tutoring program. Original color photographs by Alicia Lyman, February 19, 2003: Archive: Concerts Archive, Alicia Lyman. Hip Hop Collection, Central Florida Music History Collection, RICHES of Central Florida. Light, Alan. The Vibe History of Hip Hop. New York: Three Rivers Press, 1999. Le-Huu, Bao. "Solillaquists of Sound's saga comes to its natural conclusion: 'The 4th Wall' completes the group's epic listener's trilogy." Orlando Weekly. 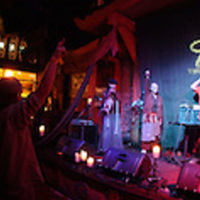 January 7, 2014. http://www.orlandoweekly.com/orlando/solillaquists-of-sounds-saga-comes-to-its-natural-conclusion/Content?oid=2241323. Strout, Justin. "Philosophy of Love." . September 21, 2006. http://www.orlandoweekly.com/orlando/philosophy-of-love/Content?oid=2274026. Lyman, Alicia. “Solillaquists of Sound at Slingapour's, 2003.” RICHES of Central Florida accessed April 22, 2019, https://richesmi.cah.ucf.edu/omeka/items/show/5305.